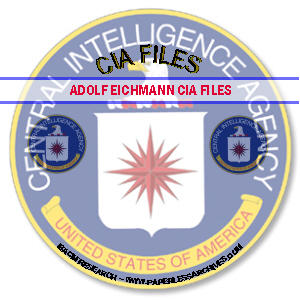 1,449 pages of Central Intelligence Agency (CIA) Files covering Adolf Eichmann. Of the 1,449 pages, approximately 1,135 are discernible. They include English and German language material. Much of the materiel was not released by the CIA until 2006. Documents in these files illustrate how the CIA and its predecessor agencies (the Strategic Services Unit and the Central Intelligence Group), as well as the Army's CIC, went about investigating rumors about Eichmann's whereabouts, mainly from hearsay and unsubstantiated assertions. The CIA did not seriously enter the chase for Eichmann until late 1959, but Israeli agents located him in Argentina first and spirited him out to Israel for trial. The file contains a vituperative diatribe by an unnamed CIA agent or source against former Nuremberg prosecutor Telford Taylor, who he termed a "comsymp" or dupe because he publicly advocated that Eichmann be tried by an international tribunal, rather than an Israeli court. Karl Adolf Eichmann (1906 � 1962) was a German Nazi SS-Obersturmbannführer (lieutenant colonel). He became the most pivotal participant in the deportation of European Jewry during the Holocaust. After the end of World War II, he found himself in American custody. However, in 1946 he escaped. In 1960, Israeli agents abducted Eichmann in Argentina and flew him to Israel, where he was tried and executed in 1962. Today, the world knows a great deal about Adolf Eichmann's escape from Europe after the war. While he was living in Argentina under the name of Ricardo Klement, Eichmann worked with the Dutch writer Willem Sassen to prepare a memoir of sorts. In it Eichmann talks extensively about his escape from Germany. After Israeli agents brought Eichmann to Israel in 1960, the authorities interrogated him rigorously. The newer American declassifications found in this collection fill in some gaps. They show what the West knew about Eichmann's criminality and his postwar movements. They show that no American intelligence agency aided Eichmann's escape or simply allowed him to hide safely in Argentina. After World War II, the emerging struggle with the Soviet Union dominated the resources and attention of the United States, even at the expense of the task of locating and punishing war criminals. The May 1960 Israeli capture of Adolf Eichmann, however, refocused public attention on those men who had managed to elude justice in the chaos of the immediate postwar period. For the CIA, this unexpected event would force a re-examination of some of the former Nazis it had recruited in the rush to produce intelligence results during the Cold War in the 1950s. CIA records show that at least five of Eichmann's associates, each a significant participant in Hitler's aggressive warfare and crimes against humanity, had worked for the CIA. Additionally, the records reveal that at least 23 war criminals or Nazis were approached by the CIA for recruitment. In early 1950, the Austrian police began asking questions about Otto von Bolschwing, a former SS officer hired by the CIA in late 1949. Bolschwing's SS personnel file had been among those captured at the end of the war. To protect this agent from any war crimes trial, however, the CIA decided that any prosecutors who asked for Bolschwing's SS personnel file should be told, "no files available." Bolschwing had worked with Eichmann before the war in planning the expropriation of Jewish property in Austria and later served as the SS consultant to the forces that staged the bloody pogrom in Bucharest, Romania in 1941. In 1953, in recognition of Bolschwing's work for U.S. intelligence, the CIA pressured the U.S. Immigration and Naturalization Service to let him enter the country. He later became a U.S. citizen. When the U.S. Congress in the 1970s forced an examination of U.S. policy toward Nazi war criminals, creating at the time the Office of Special Investigations in the Department of Justice, Boschwing was investigated and then stripped of his citizenship. OSI found Bolschwing on its own. The CIA never turned him in to law enforcement. He died in 1982. CIA name files are rarely opened to the public. The files contain information from diverse sources on individuals the CIA considers significant. They include published materials, declassified documents, interrogations, confidential reports from agents or informants, and CIA analytical reports. Eichmann's file contains basic information about the man and his career in Nazi Germany, much from captured German records. 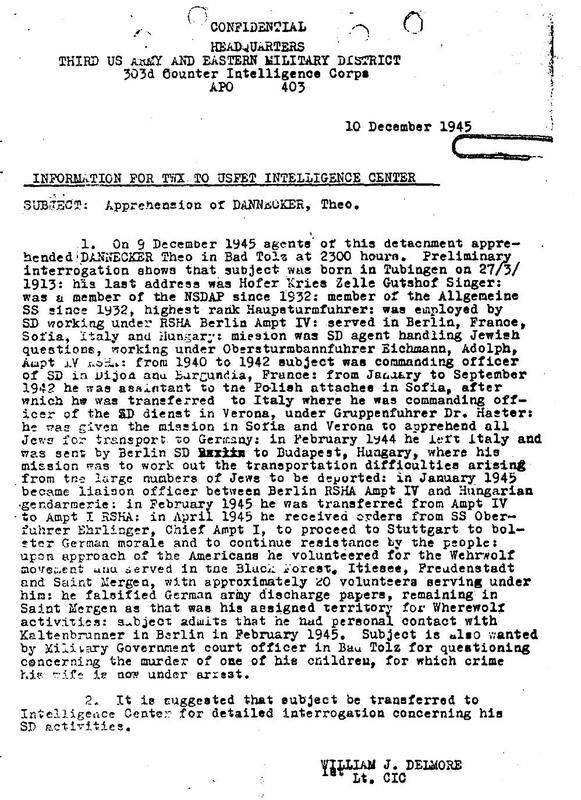 Documents in this file mainly illustrate how the CIA and its predecessor agencies, the Strategic Services Unit (SSU) and the Central Intelligence Group (CIG), as well as the Army Counterintelligence Corps (CIC), went about investigating rumors about Eichmann's whereabouts and postwar activities, mainly from hearsay and unsubstantiated assertions; the file also contains copies of newspaper and magazine articles. Eichmann was purportedly in Egypt when the CIA entered the chase late in the game, toward the end of 1959. When Eichmann was accurately rumored to be in Argentina, CIA agents interrogated presumably knowledgeable persons, i.e., Eichmann's former Reich Security Main Office (RSHA) colleagues. Eager to ingratiate themselves, they gladly peddled hearsay to their uninformed interrogators. Two persons had given some substantial information in 1945-46 to CIC interrogators: Wilhelm Hoettl, who made his postwar living peddling hearsay to the conquerors; and Kurt Becher, who successfully passed himself off as the "white hat" among the SS. These two had at least seen and talked to Eichmann at the last RSHA Amt IV (Gestapo) evacuation station at Bad Aussee in Austria during the closing days of the Second World War. 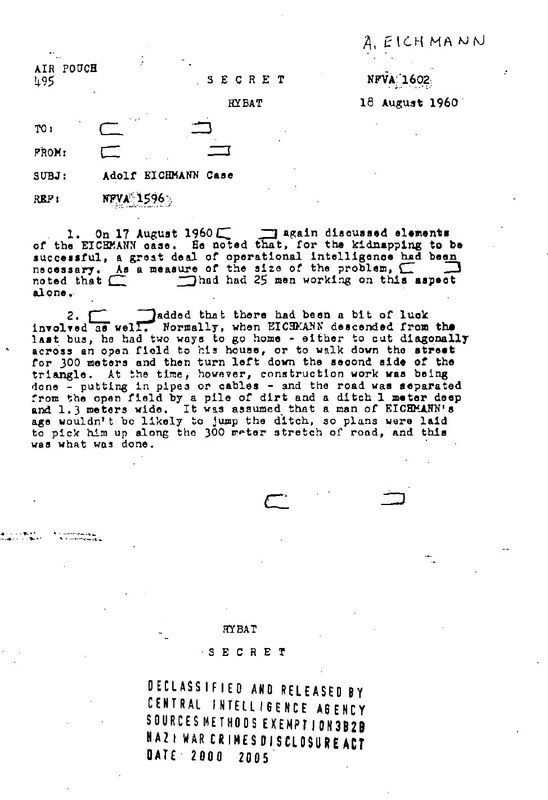 The CIA was interested particularly in how Eichmann was captured. 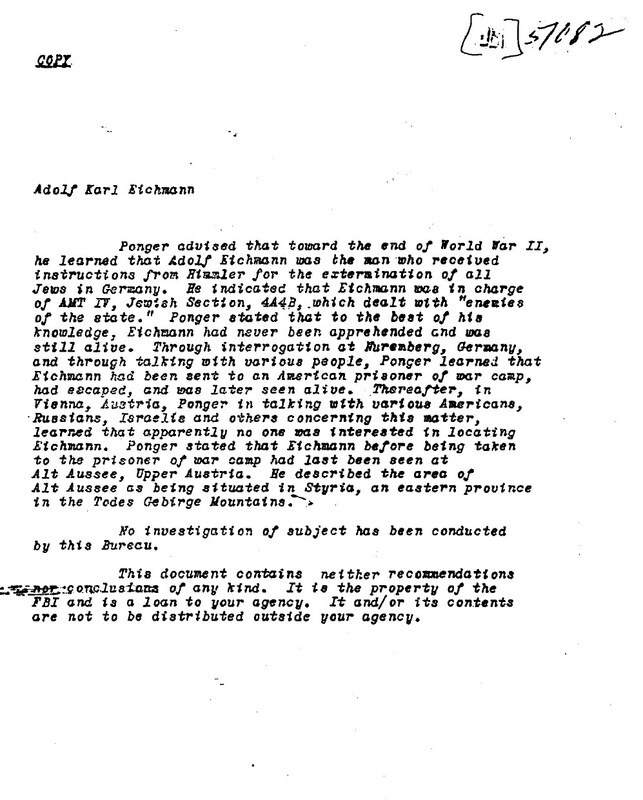 A series of documents reflect United States concern that Argentina was threatening to bring the Israeli kidnapping of Eichmann before the United Nations Security Council. This was successfully forestalled by an American-mediated compromise. In the summer of 1960, CIA agents were particularly concerned with the bona fides and intentions of three West German investigators, headed by the chief of the Ludwigsburg Central Office for Prosecution of Nazi Crimes (Zentrale Stelle der Landesjustizverwaltungen), Dr. Erwin Schuele. He came to Washington seeking evidence against some 1,200 Nazis, including Eichmann, whom the Federal Republic of Germany had already indicted as war criminals to forestall inhibition of their prosecution by the long-standing West German 20-year statute of limitations. An analyst for the American Historical Association, Robert Wolfe, who was preparing guides to the captured RSHA records, was instructed to provide direct references to Dr. Schuele. When Israeli prosecutors preparing their case against Eichmann also requested this information, CIA investigators passed it on without attribution. Also among the documents in the CIA's file on Eichmann are 334 pages of German Foreign Ministry files (Auswartiges Amt: Inland II Geheim Endloesung), which include the 15-page, so-called Wannsee Protokoll. This file, not yet discovered during the International Military Tribunal at Nuremberg, was released in the course of the American zonal trial of German Foreign Ministry defendants. Also reflected in the Eichmann file are some difficulties with the International Tracing Service (ITS), which at first blocked access to its Eichmann files on grounds of protecting privacy of victims, a practice which inadvertently protected culprits. ITS, by then an agency of the International Red Cross, was the successor of the United Nations Rescue and Relief Agency (UNRRA) and the International Refugee Organization from which it derived its records, which was set up to trace the whereabouts of missing persons. After some persuasion, however, ITS did make its Eichmann material available. A disturbing item in the Eichmann file is a vituperative diatribe against Nuremberg prosecutor and later author Telford Taylor by a patently biased CIA agent or informant. He dubbed Taylor a "comsymp" or dupe because Taylor had publicly advocated that Eichmann be tried by an international tribunal rather than an Israeli court. Some accused Taylor of anti-Semitism for this recommendation. But he was following precedent. During the four-power negotiations in the summer of 1945 which culminated in the London Charter establishing the Nuremberg trials, U.S. chief prosecutor Robert Jackson had demonstrated that he was not prepared "to lay down a rule of conduct against others which we would not be willing to have invoked against us." Taylor liked the notion of international standards that applied to everyone, including the United States. One item in the Eichmann files supplies information on U.S. Military Government official Kurt Ponger, who was convicted of supplying information to East Germany. A document of interest discusses speculation that Eichmann, like Hitler at Landsberg Prison, was writing his memoirs in his Jerusalem cell. Documents showing that The West German government was wary of exposing Eichmann because officials feared what he might reveal that Hans Globke, then serving as a top national security adviser to Chancellor Konrad Adenauer, was a former Nazi government official. In 1960, also at the request of West Germany, the C.I.A. persuaded Life magazine, which had purchased Eichmann's memoir from his family, to delete a reference to Mr. Globke before publication, the documents show. Documents detailing the capture of Eichmann by Israel. Senator Edward Kennedy Letter to the American Ambassador in Damascus on Nazi War Criminal Alois Brunner, a close associate of Eichmann. Captured SS Documents and a Hand-Written Letter Signed by Eichmann. "CIAs Support to the Nazi War Criminal Investigations" - Published by the Center for the Study of Intelligence, Central Intelligence Agency. An article by Kevin C. Ruffner, who was serving on CIA?s History in the CIA's internal journal, from the issue Studies in Intelligence, Volume 40, No. 5, Semiannual Edition, 1997, No. 1. Documents show that the CIA was surprised in May 1960 when the Israelis captured Eichmann. Cables from the time show that Allen Dulles, the CIA director, demanded that officers find out more about the capture. "The CIA and Adolf Eichmann - Worldwide Media Bit on an Erroneous Sound Bite" - An essay by Robert Wolfe a National Archives and Records Administration former employee, and who at the time this essay was written, an independent contract historian with the Interagency Working Group (The Nazi War Crimes and Japanese Imperial Government Records Interagency Working Group). In the essay he gives his analysis of the CIA place in the search for Adolf Eichmann.